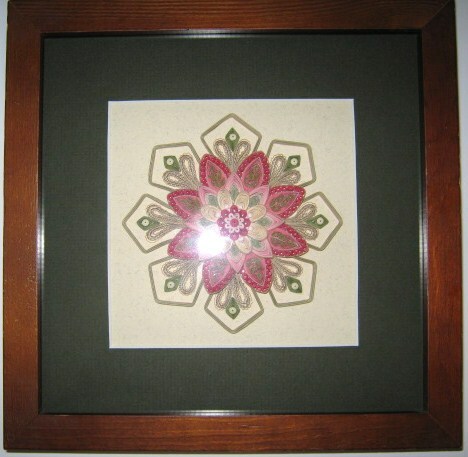 Australian Quiller Christine Donehue is selling her multi award winning piece - Pink Lotus. Paper Used: Mostly 1.5mm with some 3mm. Small green leaves are 1.5mm cut in half. First 2009 Perth Royal Show: Greeting card, any technique and most outstanding exhibit in greeting cards. Judges comments: Exquisite card. Beautiful work. First 2009 Royal Queensland Show (Ekka): Quilled greeting card. 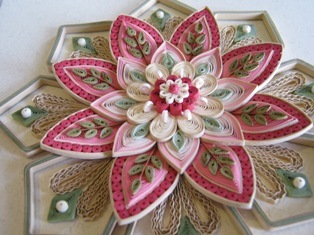 Judges comments: Good composition of very neat traditional quilling, using a nice blend/mix of colours. Well done with attention to detail. Second 2009 Royal Melbourne Show: Single greeting card, any technique. Photocopies of prize certificates are available. This design is also available unframed on a greeting card.